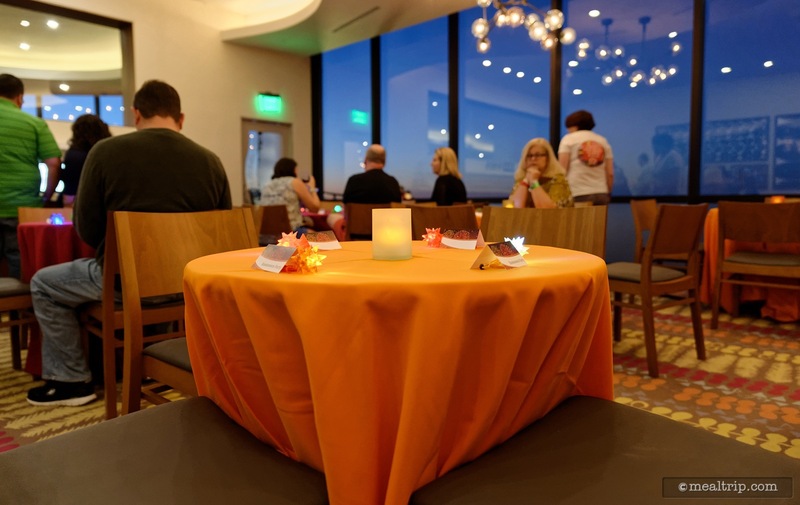 The Celebration at the Top - Savor, Sip, and Sparkle listing is a Special Event dining location at Disney's Contemporary Resort featuring American, Wine, Beer, Spirits or Beverage-based cuisine. 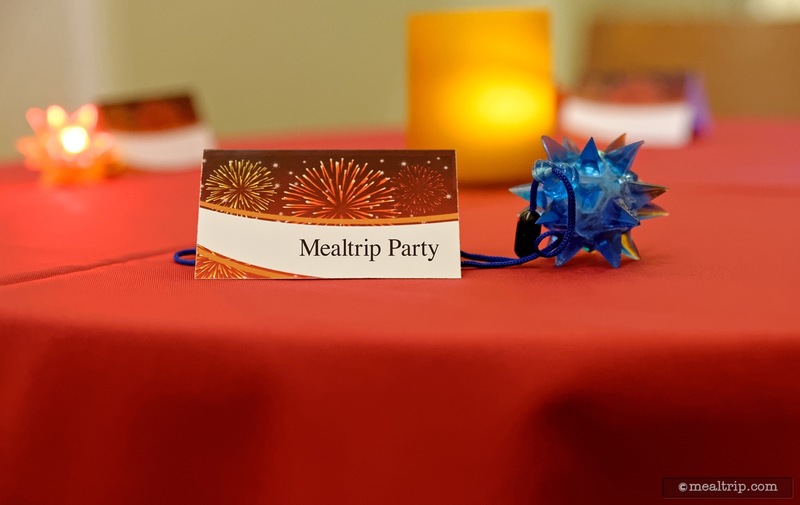 There are 62 photos in the Mealtrip photo gallery for this location and dining period. 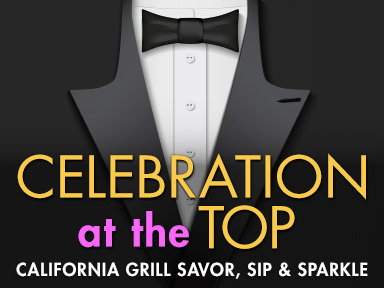 The Celebration at the Top - Savor, Sip, and Sparkle listing currently has a score of 89 out of 100. 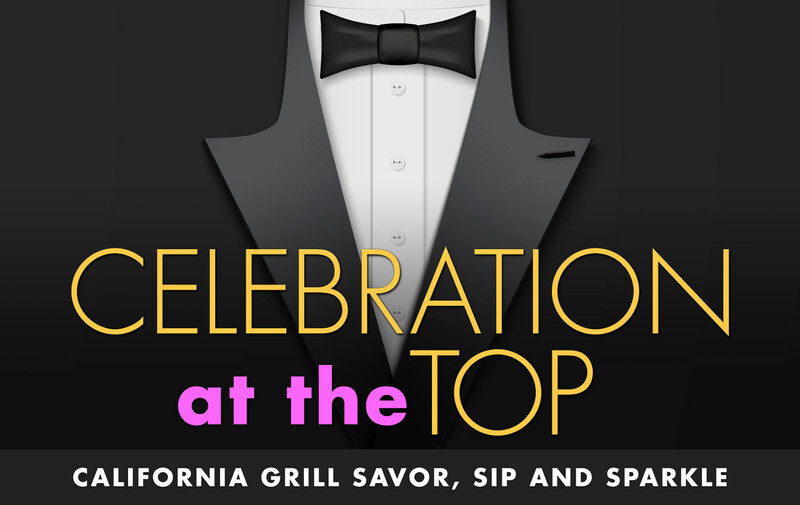 Click here to read all of the reviews for this location, or log in to Mealtrip.com to add your own review for Celebration at the Top - Savor, Sip, and Sparkle. 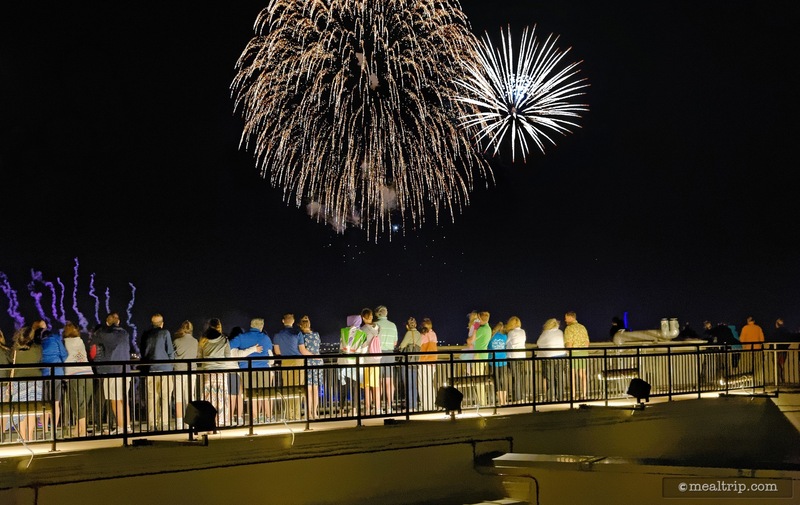 Celebration at the Top - Savor, Sip, and Sparkle is a fireworks party taken to the nines. 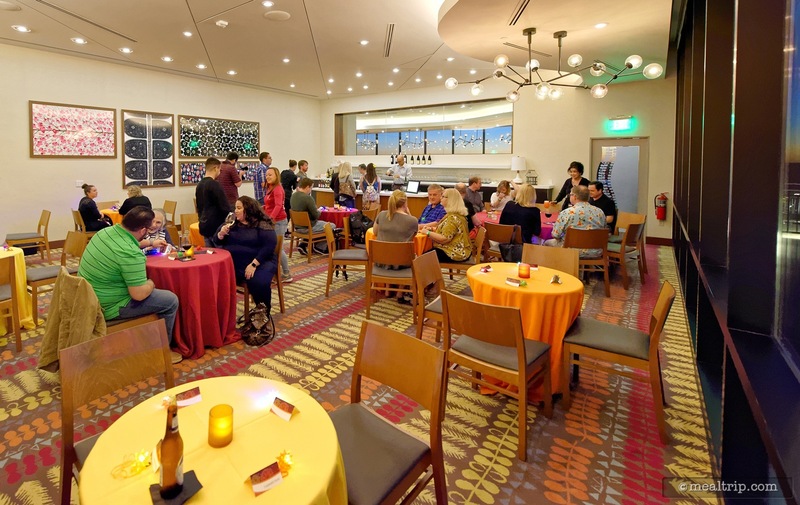 The check-in area for Sip, Savor and Sparkle is on the 2nd floor of the Contemporary Resort. 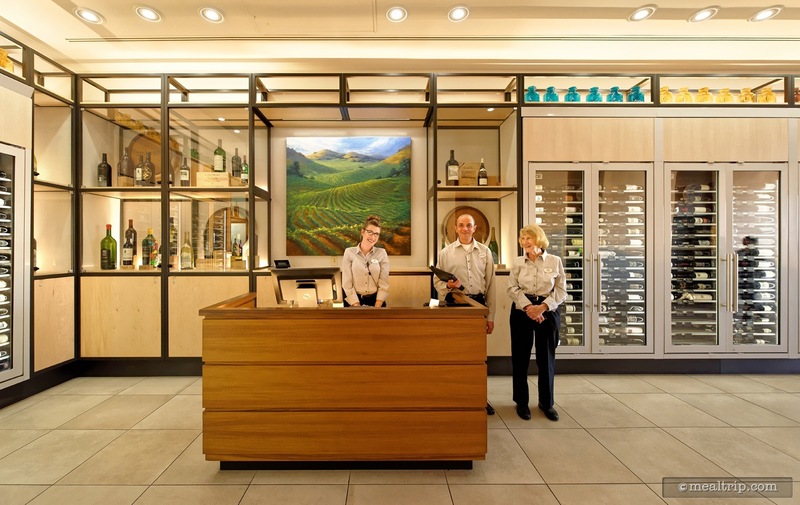 Once you make it up the elevator, there's a secondary welcome podium in the "wine hallway". You don't need to check-in again though. You will be wearing a sparkly bracelet for the special Celebration at the Top event. 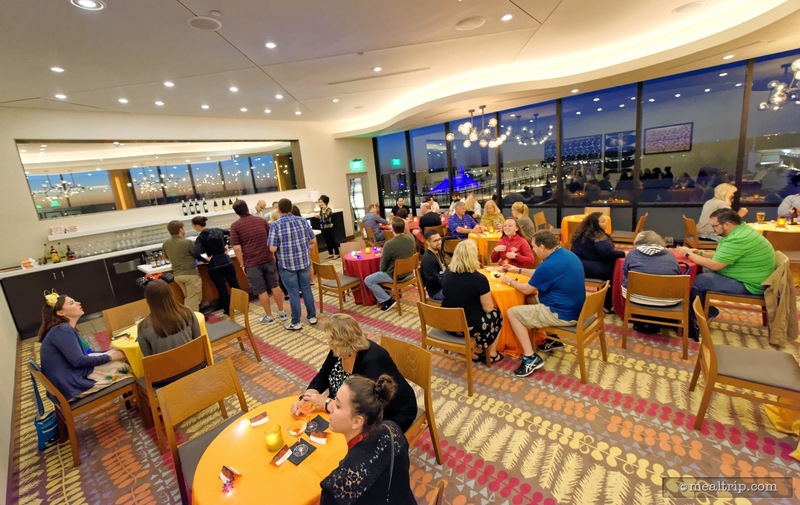 You can wait in the California Grill Lounge before the Celebration at the Top event begins. 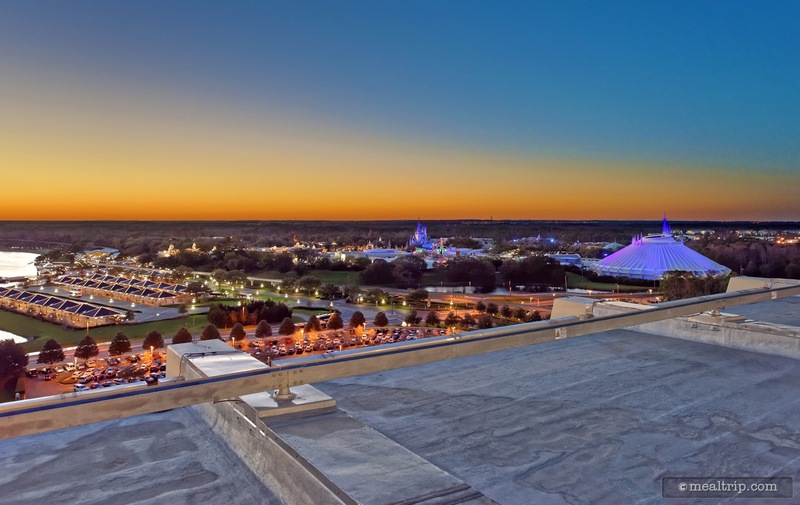 Even simple, cloudless sunsets are amazing to watch from the 15th floor of the Contemporary Resort. 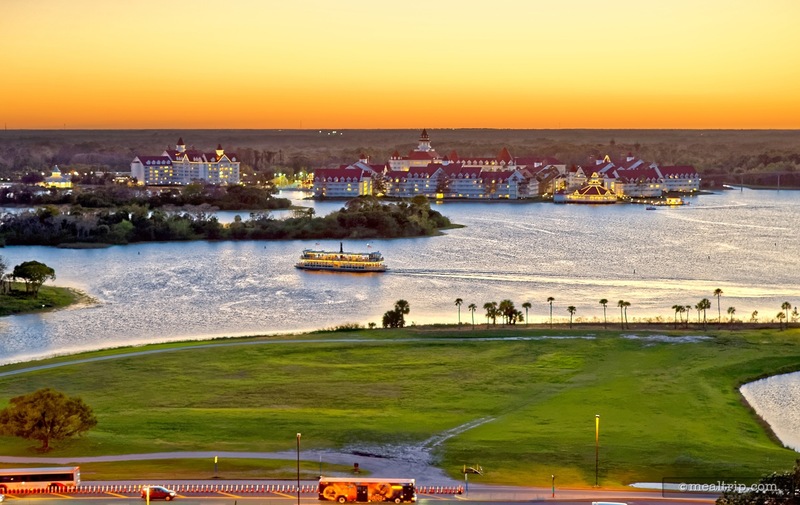 As the sun sets even further, the lights from the Magic Kingdom begin to light the park. How cool is that? 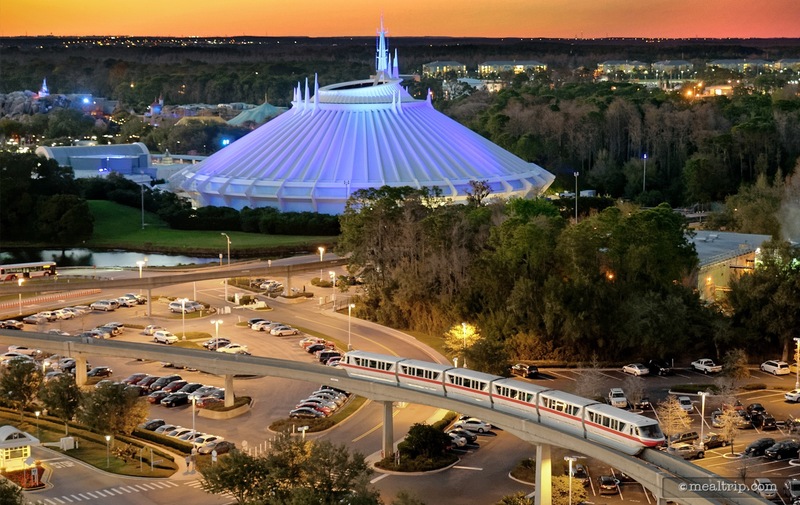 A monorail and Space Mountain as seen from the 15th floor observation platform. 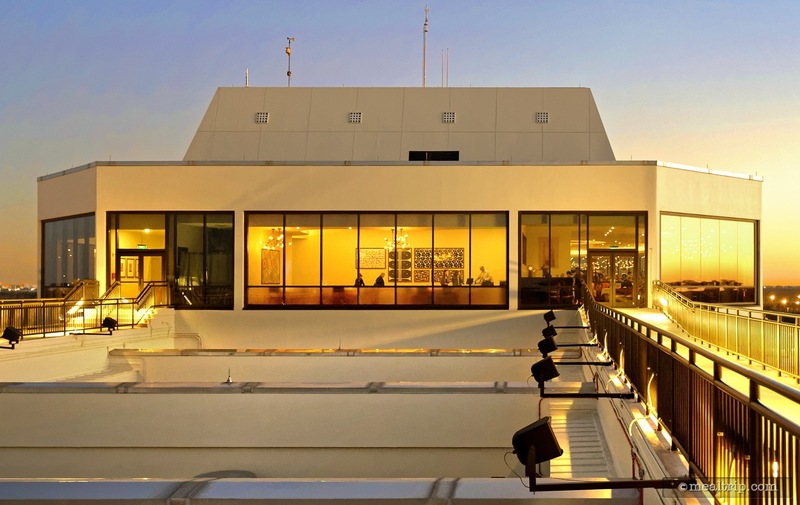 That building way back there is the north-most exterior door that leads back into California Grill. The window in the middle is where the Celebration at the Top event takes place. 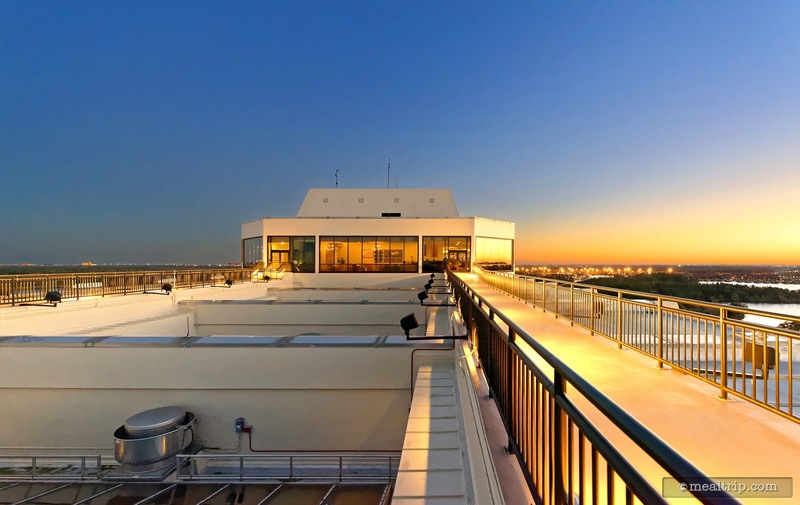 This is the main event space for Celebration at the Top - Savor, Sip and Sparkle. Everyone gets a squishy sparkle star to wear! Love those squishy sparkle stars! 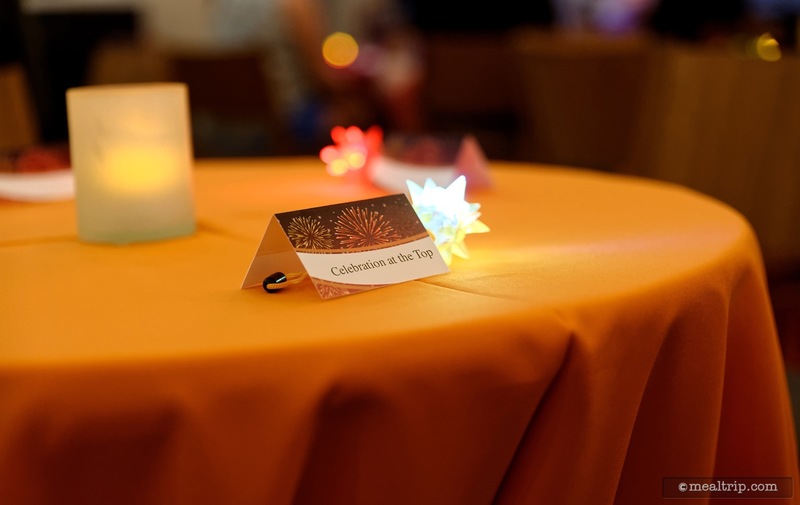 On the first night of the event, there were little party name tags on each table. However at future events, the tables themselves may be named... making a bit easier to locate your table and chair. 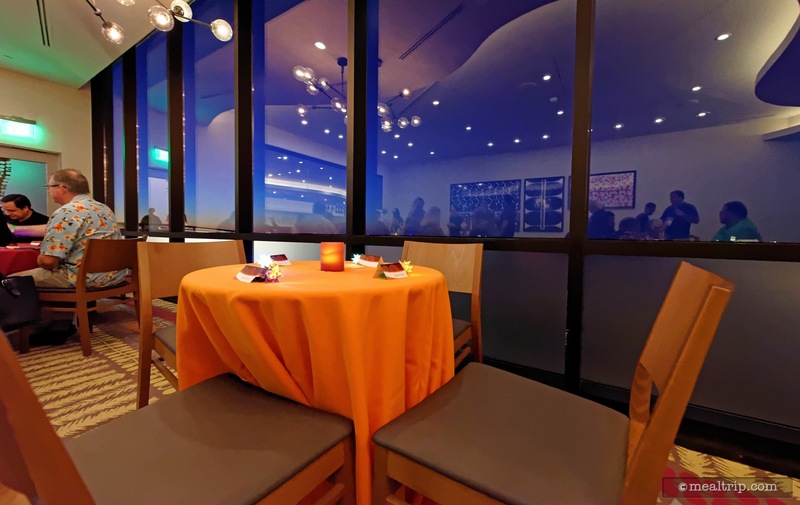 There are a couple of tables right next to the floor to ceiling windows. This table is in the middle of the room. 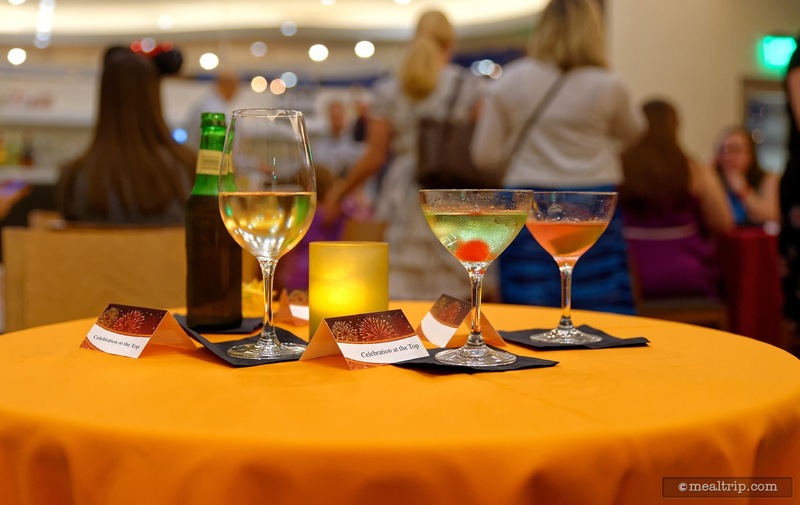 This is pretty much the entire "seating" space at the Savor, Sip and Sparkle event. 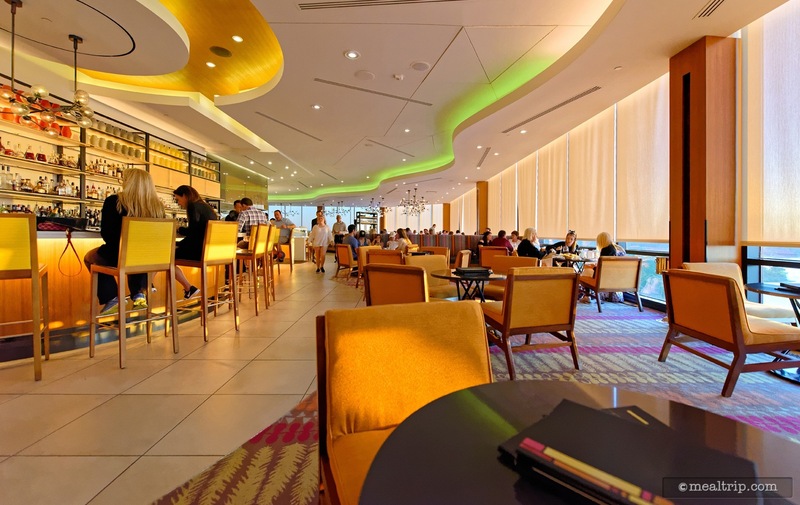 The open bar is located on the left hand side of this photo. Another photo of the main seating area, this time, taken from the window area looking into the room. 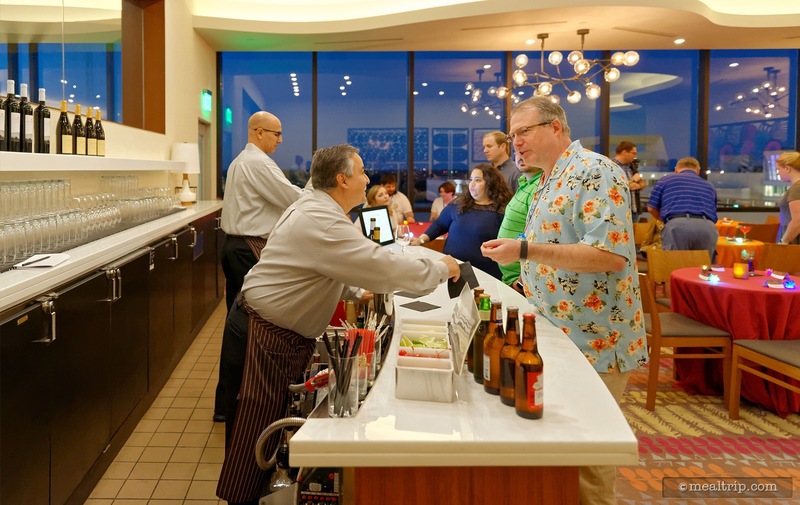 Here's a cross-section of the bar area. Two bartenders for less than 50 guests is a pretty good ratio. 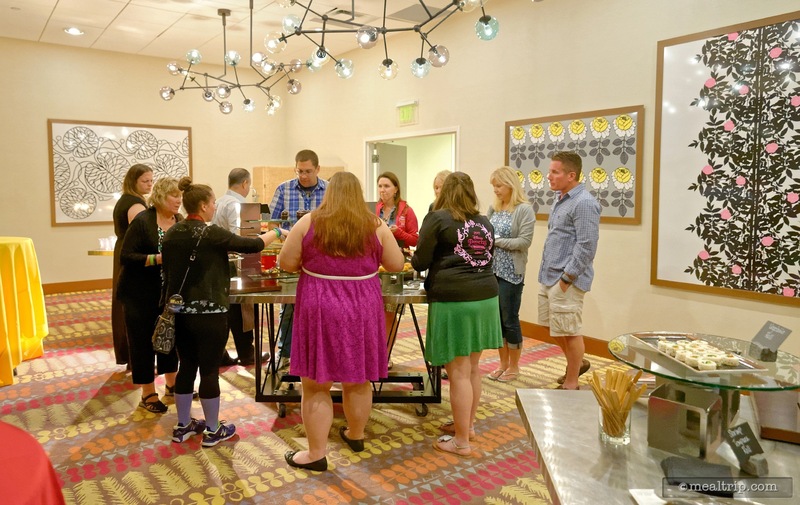 The "food station" room is just across the hall, and is only half as large. The whole idea here is, you pick-up food here, and bring it back to your table in the other room. This is about as full as the "food room" ever was. The pacing was fine and there was no need to rush. 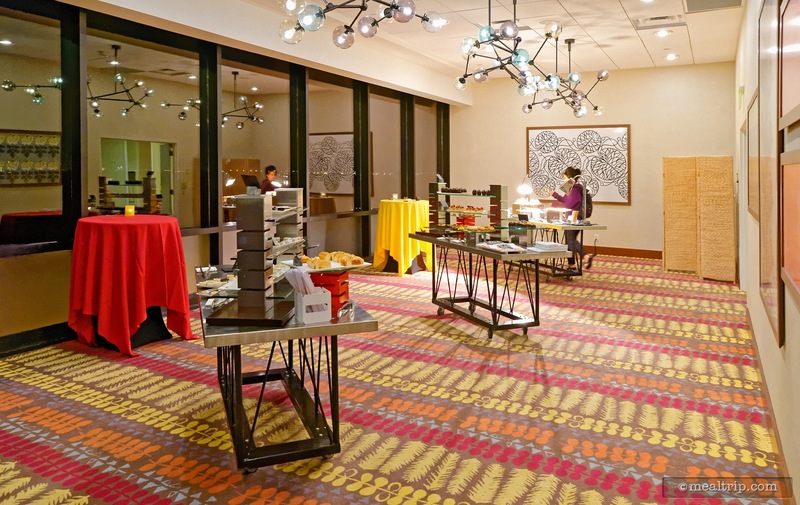 Here's another photo of the "food room" at the Celebration at the Top - Savor, Sip and Sparkle event. 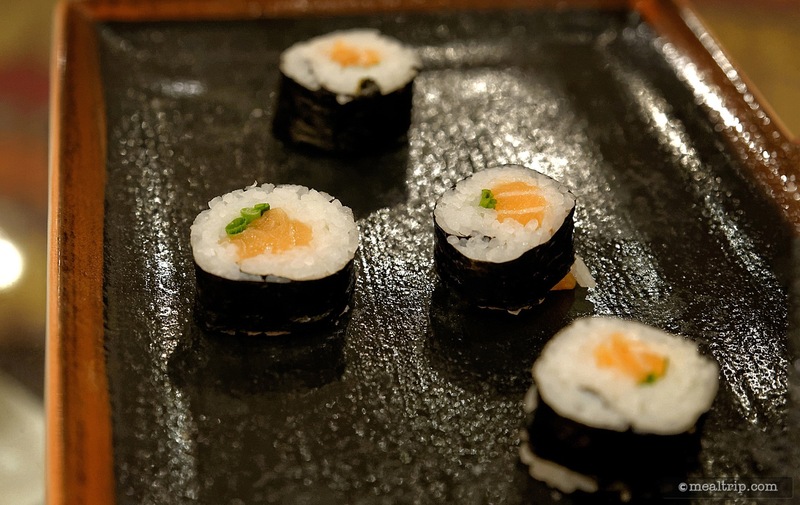 From the sushi table at Celebration at the Top, Salmon and Chive Roll. 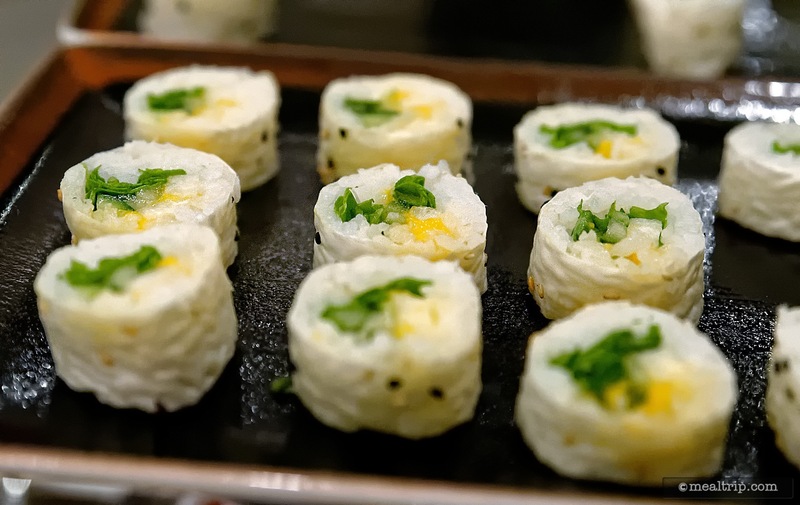 From the sushi table at Celebration at the Top, the Vegetable Roll. 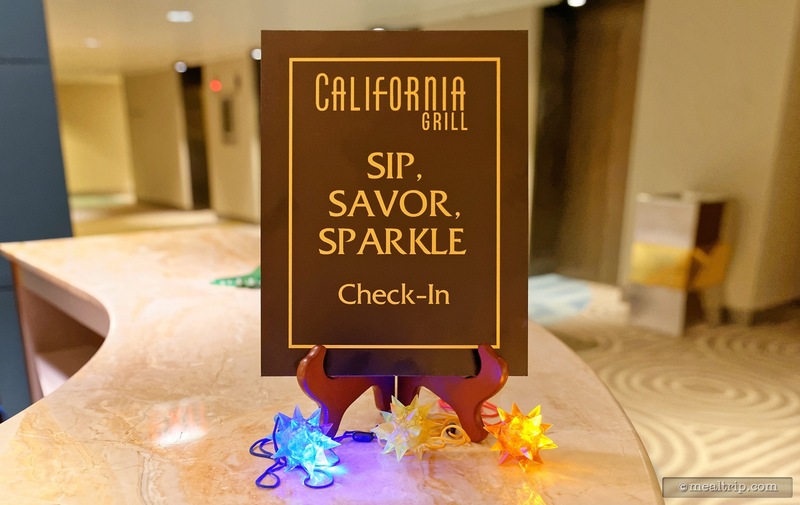 The California Roll at Celebration at the Top - Sip, Savor and Sparkle. 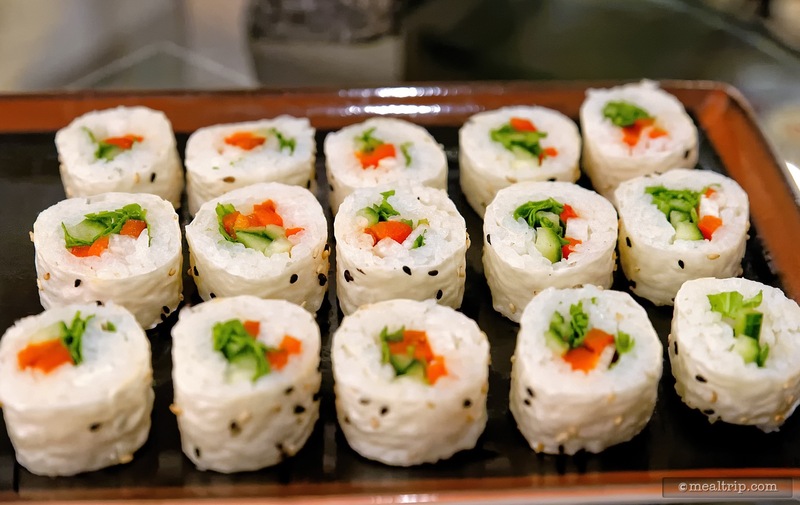 The Sushi at the Celebration at the Top event is just so pretty! 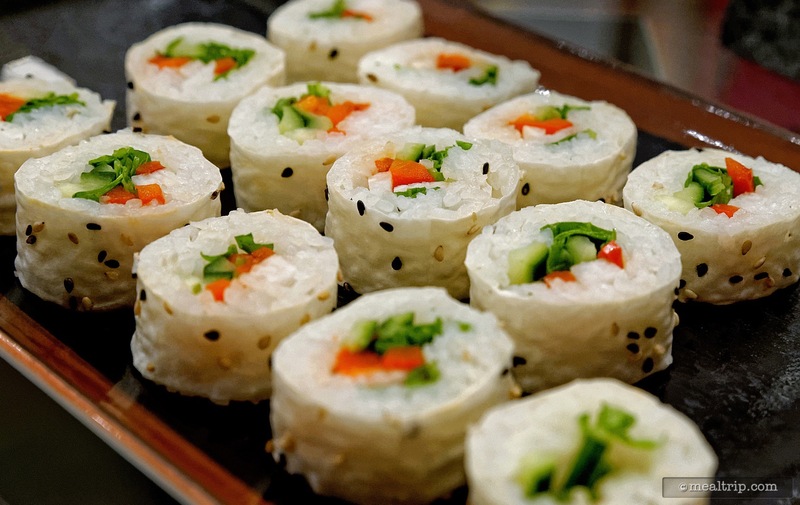 A closer look at the Vegetable Roll. 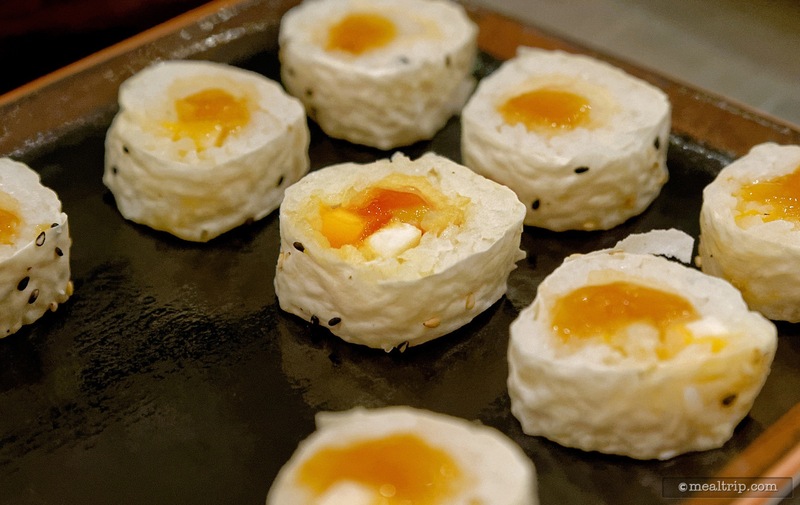 From the sushi table at Celebration at the Top, Shrimp Tempura Roll. Mmmmm... 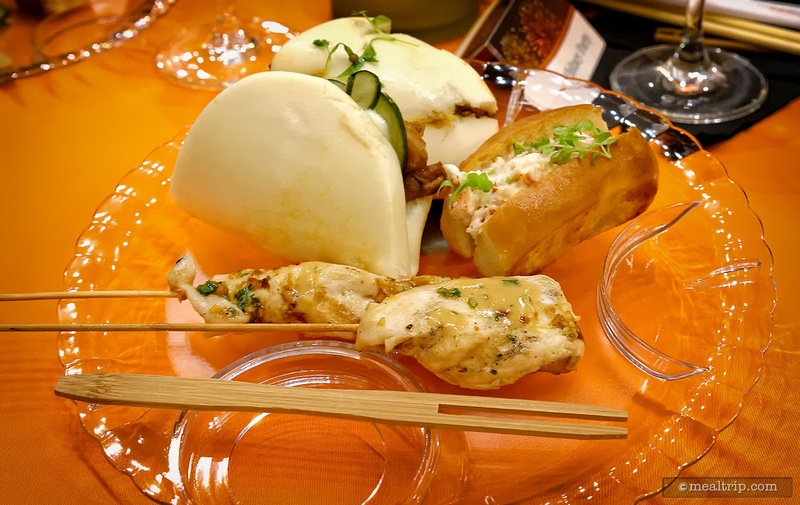 Lobster Rolls at the Celebration at the Top event at California Grill. 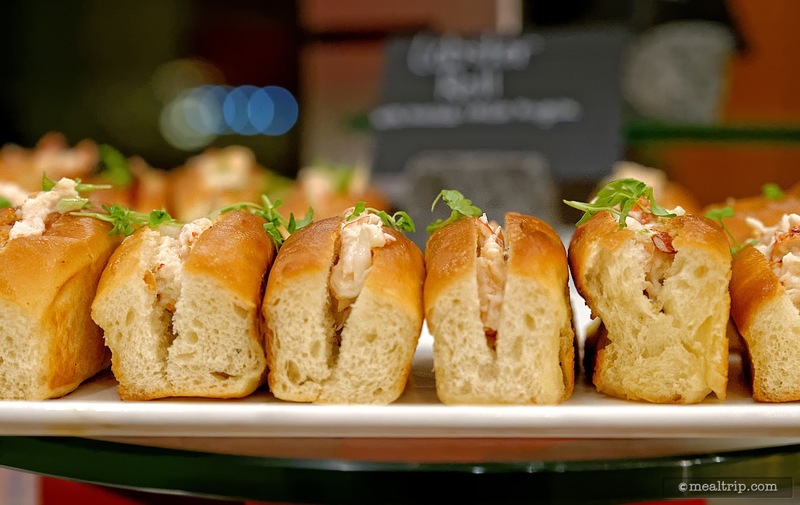 Lobster Rolls with Avocado & Micro Arugula. 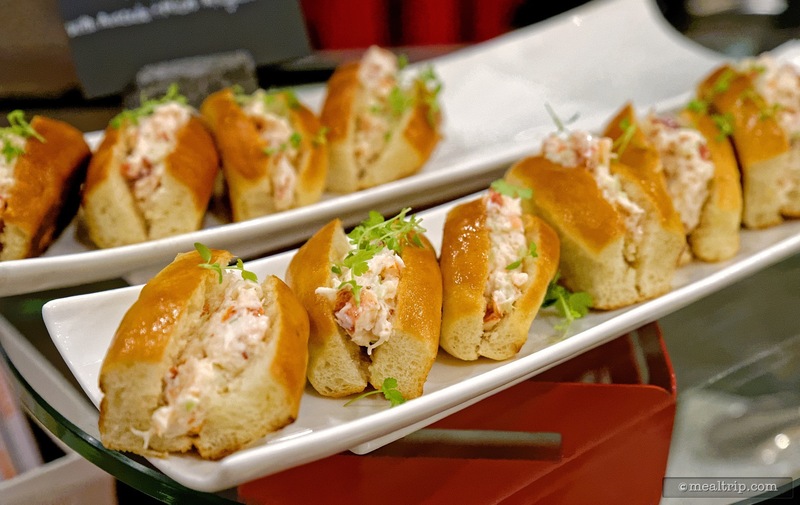 You can have as many Lobster Rolls as you want at the Sip, Savor and Sparkle event! 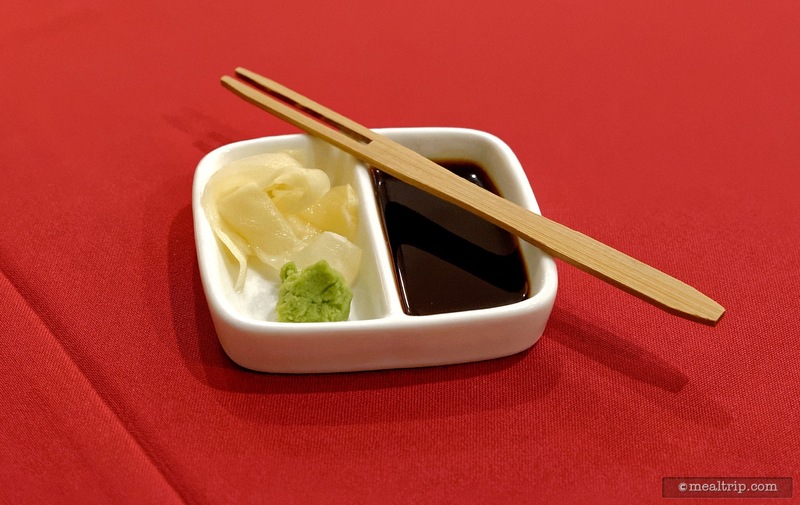 A cute little side-car of Pickled Ginger, Soy and Wasabi was available for your sushi selections. 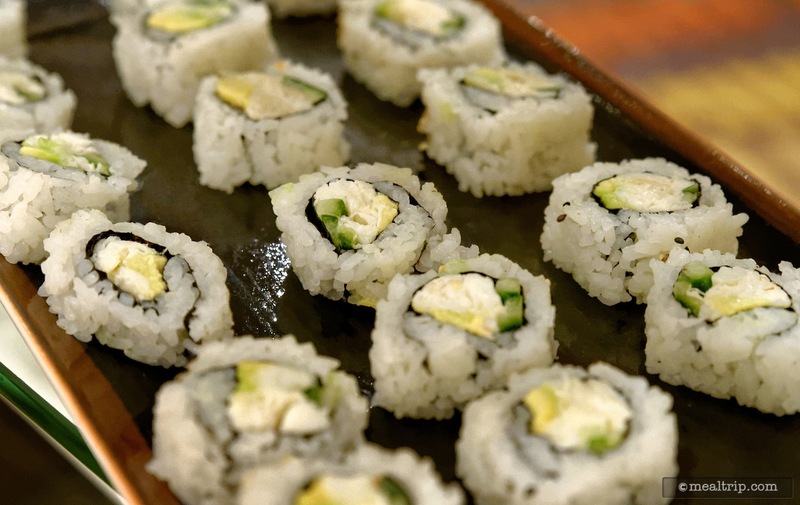 My first plate of sushi at the Celebration at the Top event. 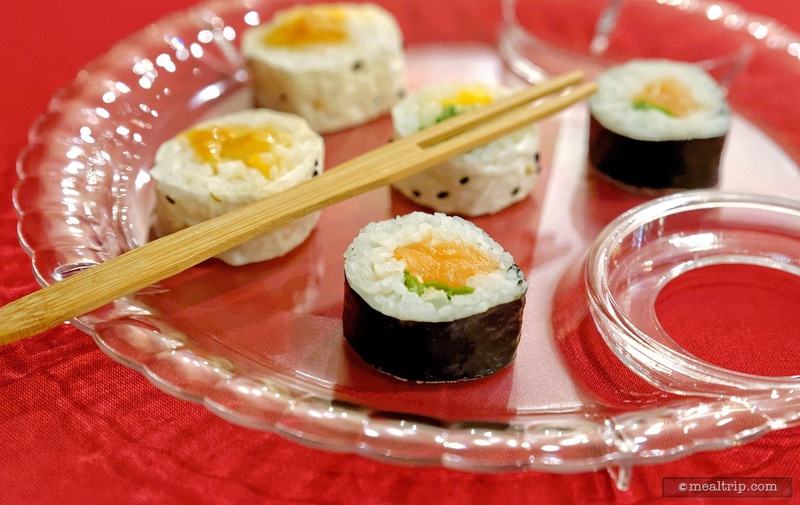 I wasn't crazy about these plates at first, but I eventually figured them out... and they were quite nice for holding sushi. 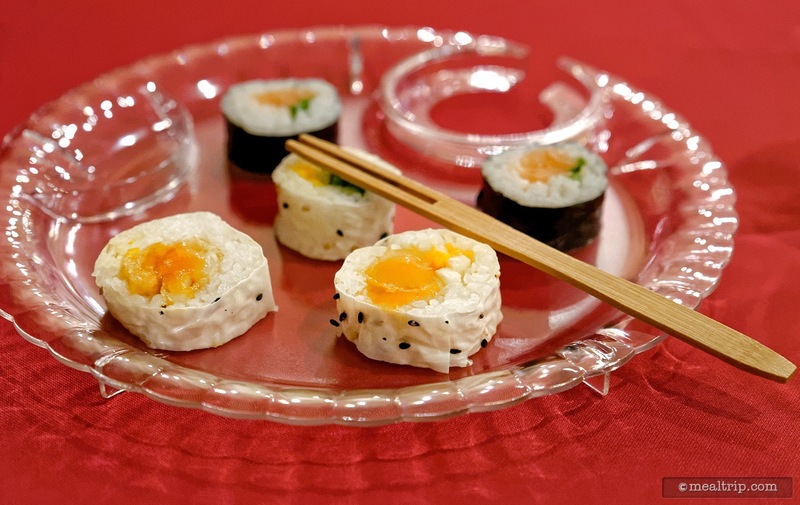 Hey cool, I found different plates for my third mini-plate of sushi! 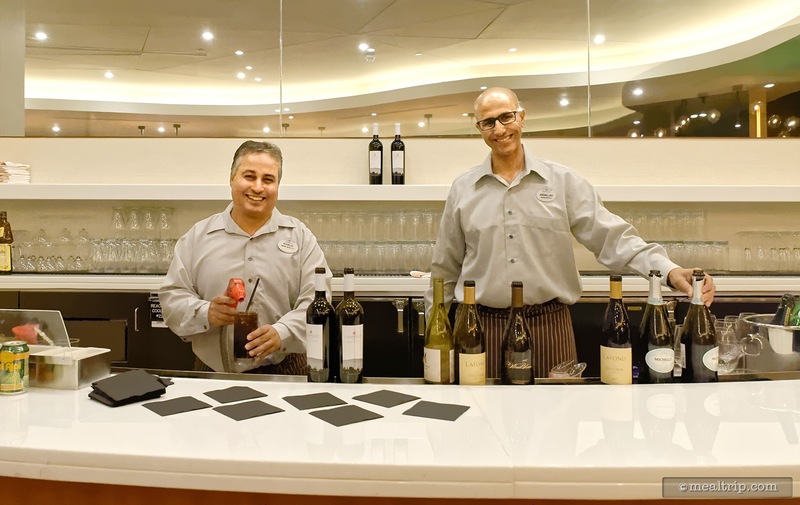 Wow, there were two bartenders for less than 50 guests! That's one of the best ratios I've seen at a Fireworks party! It seemed as though the bartenders could make just about anything. Pictured here is my glass of WindRacer Chardonnay, an Appletini and a Manhattan. 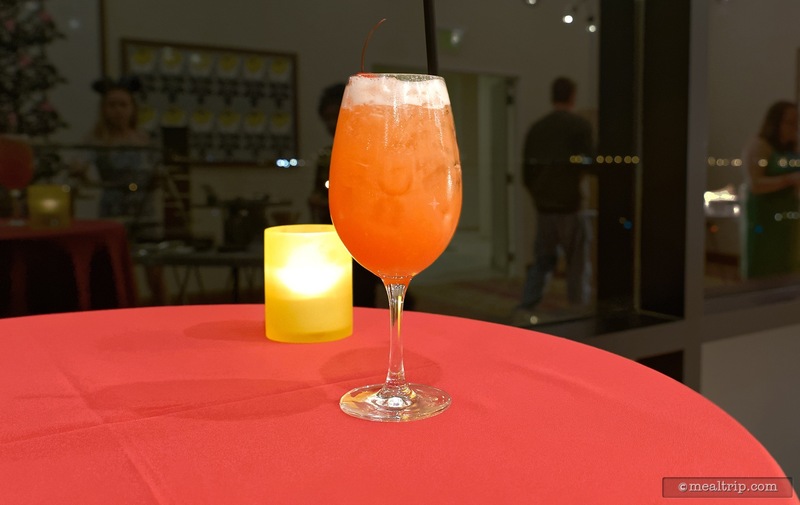 A hero shot of the Rum Punch. 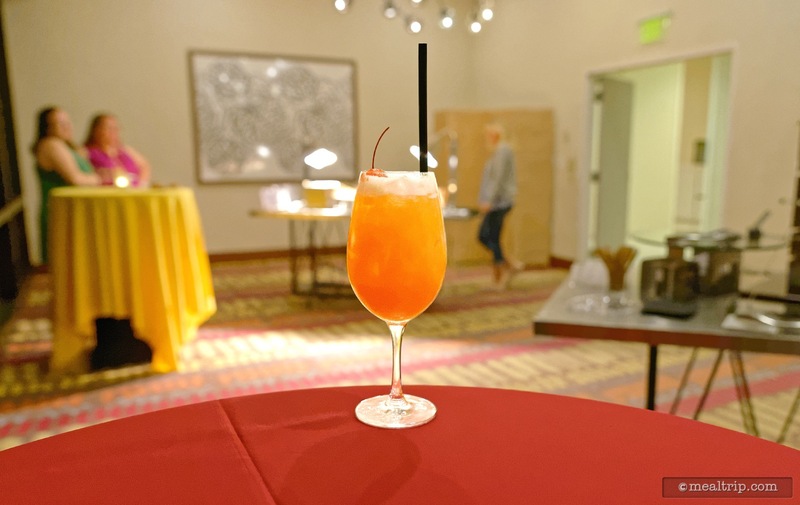 Most of the "open bars" at Disney "should" be able to make this one. It's really easy to drink. 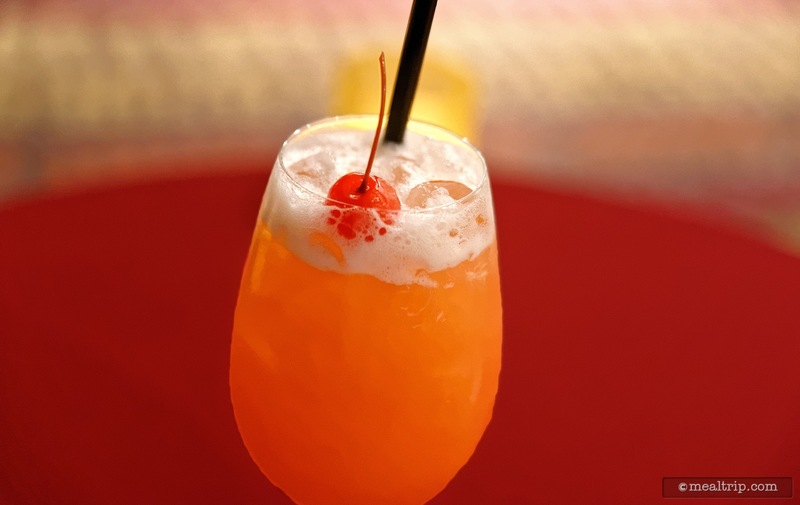 A closer look at the shaker mixed Rum Punch (with cherry). What??? 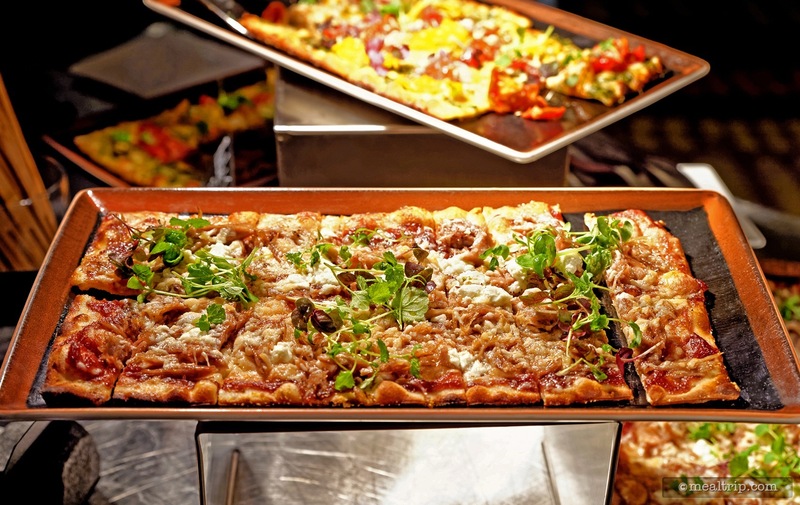 A whole Duck Confit Flatbread just for me? You shouldn't have. 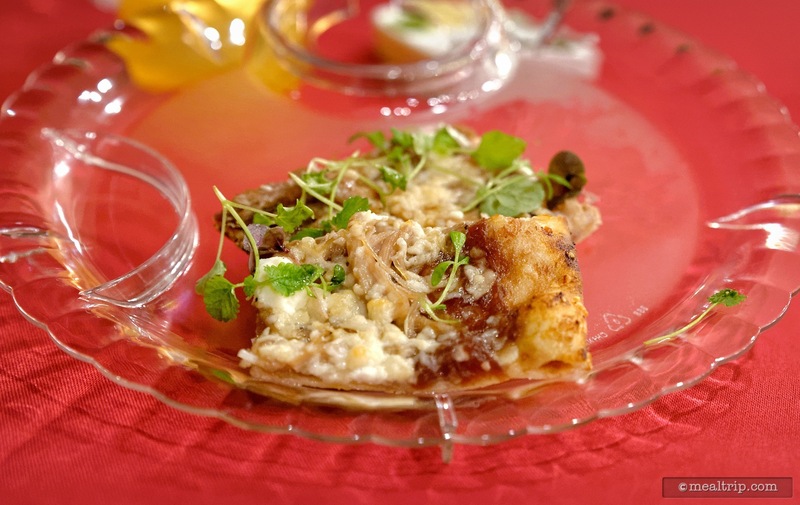 Even under all those keep-warm lamps, the Duck Confit Flatbread with Red Onion Jam, Laura Chenel Goat Cheese and Candied Pecans looks amazing! 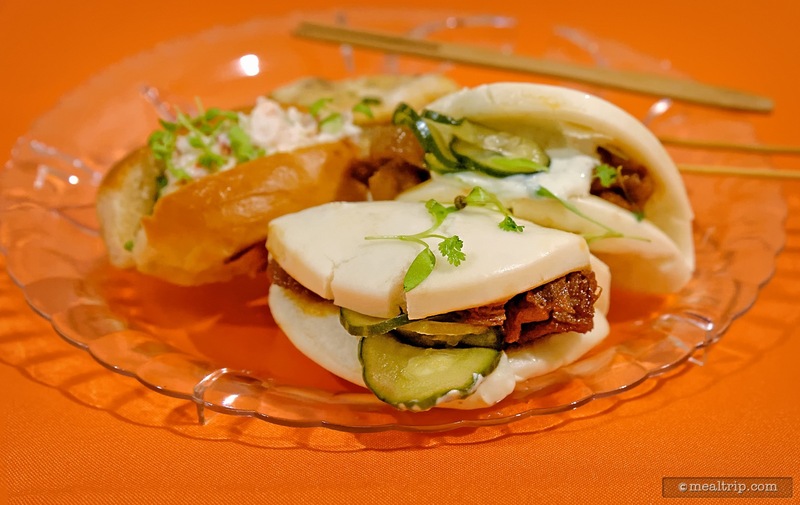 This is the Pork Belly Bao. 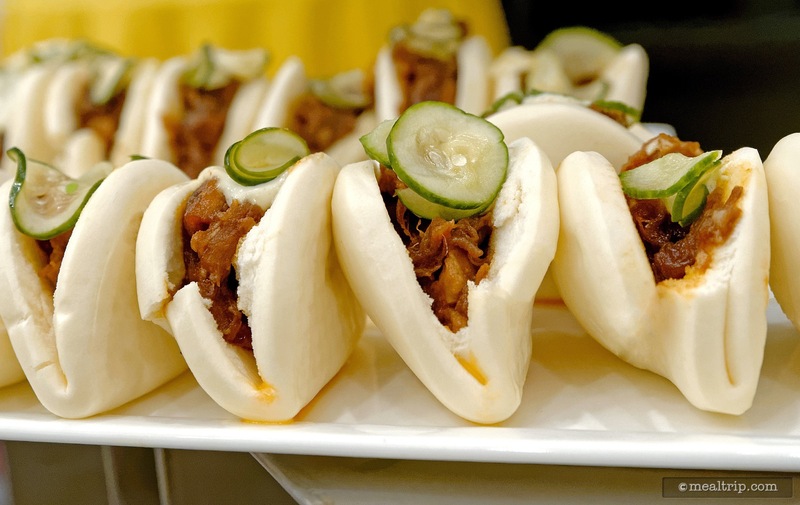 The "Bao" is that steamed bun, and it's often associated with Asian cuisines. 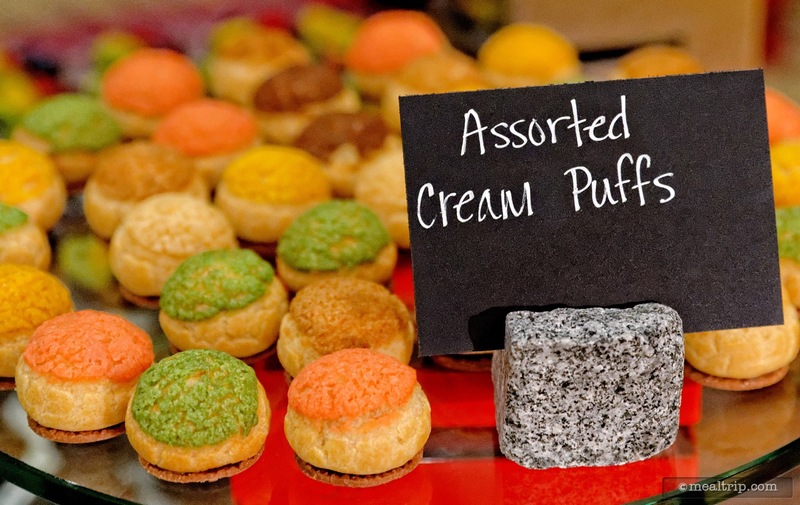 This was a very popular item at the Sip, Savor and Sparkle event. A bunch of Tandori Style Chicken Satay Sticks are all piled up and ready to go! 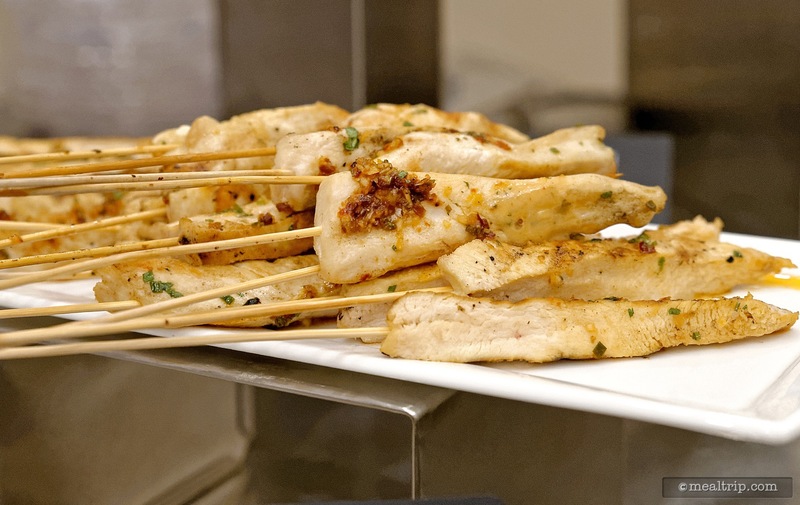 A Vietnamese Peanut Sauce was available to drizzle on or beside your Chicken Satay Sticks. 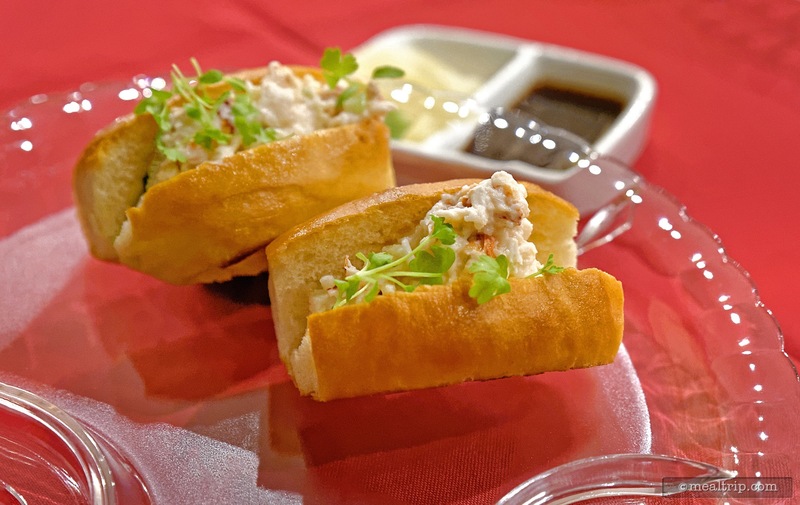 One of my countless warm plates always seemed to contain yet another Lobster Roll. How did that happen? A couple of the Chicken Satay Sticks with that Vietnamese Peanut Sauce drizzled on them. I'm so glad I found these plates! 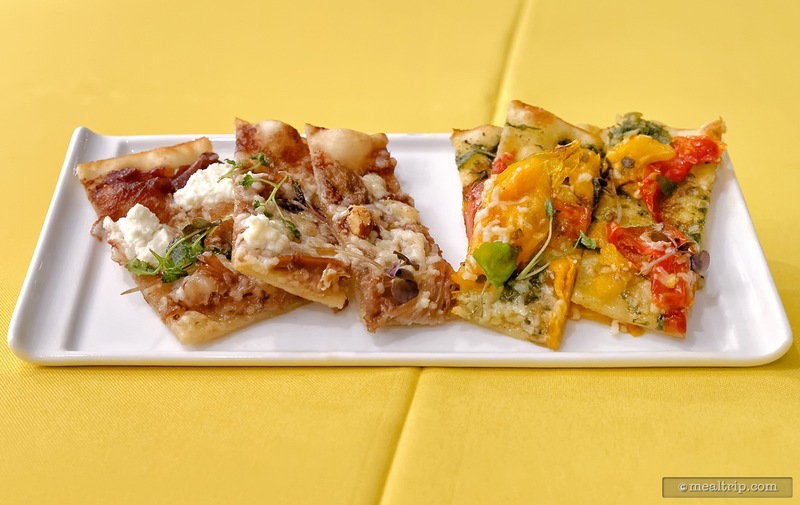 Here are the two flatbreads... the Duck Confit Flatbread is on the left and the Roasted Tomato Flatbread is on the right. 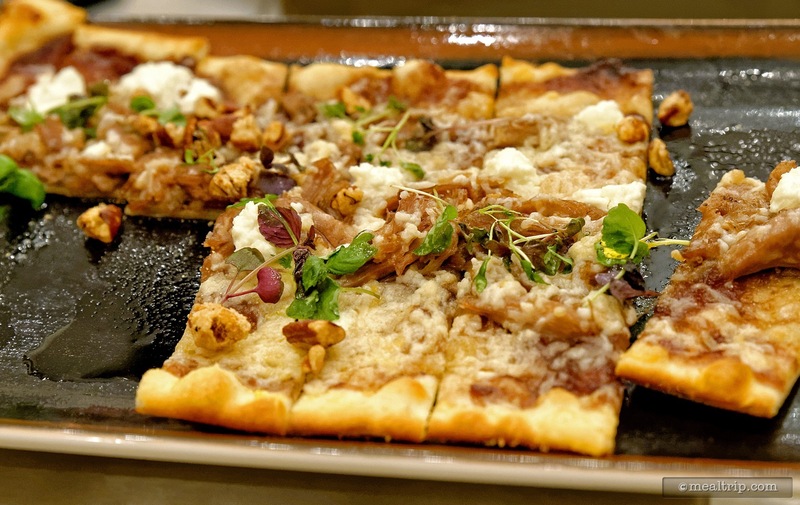 A closer look at the Duck Confit Flatbread with Red Onion Jam, Laura Chenel Goat Cheese and Candied Pecans. 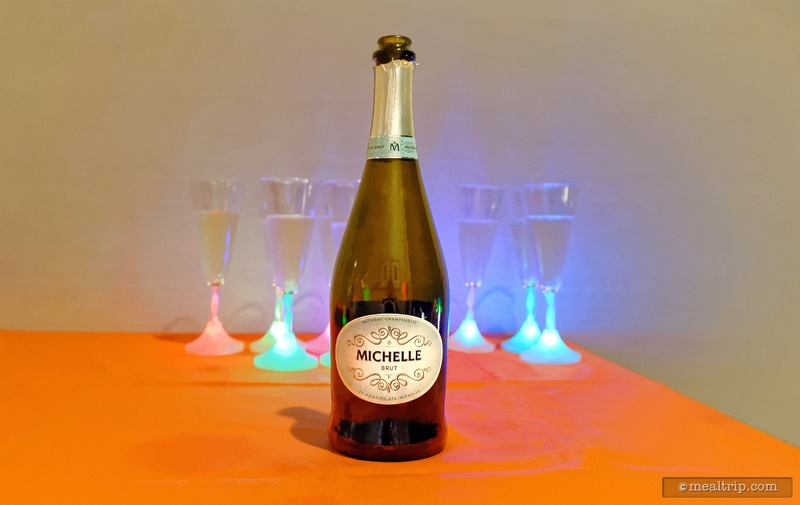 Just before the fireworks start, everyone is given a glowing plastic flute of sparkling wine (yes, you can keep the glass), and you can head outside to the observation deck, or stay inside and watch from the main dining area. 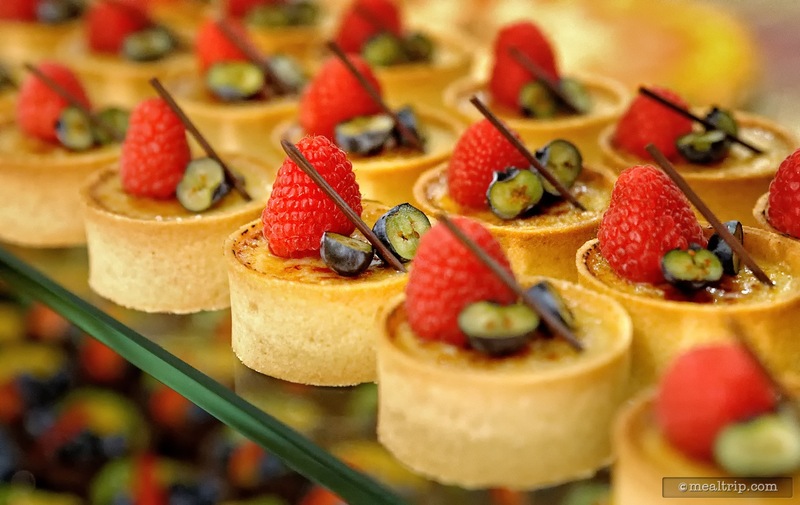 While you are watching the fireworks, and new food table is rolled out, and this one has all the desserts! 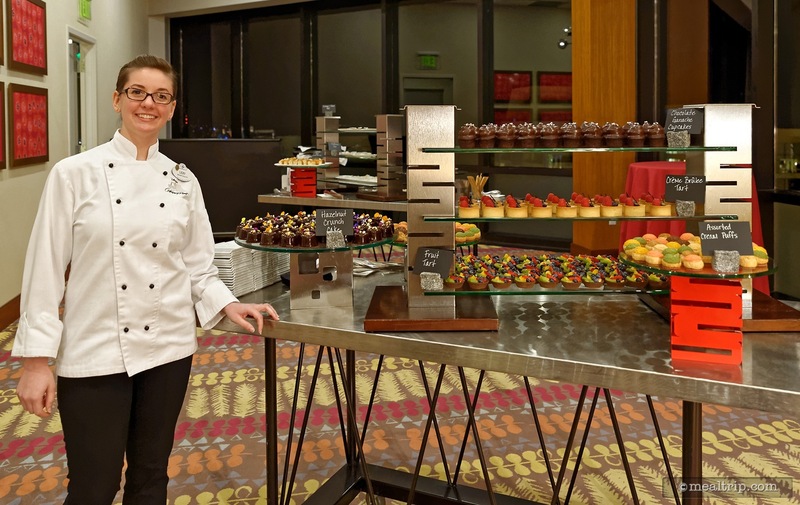 Hi Pastry Chef Lexi... everything is amazing!!! These cool little chalk board signs were close to most of the food. Not always close enough to make for a great photo... but close enough so you could tell what you were eating. 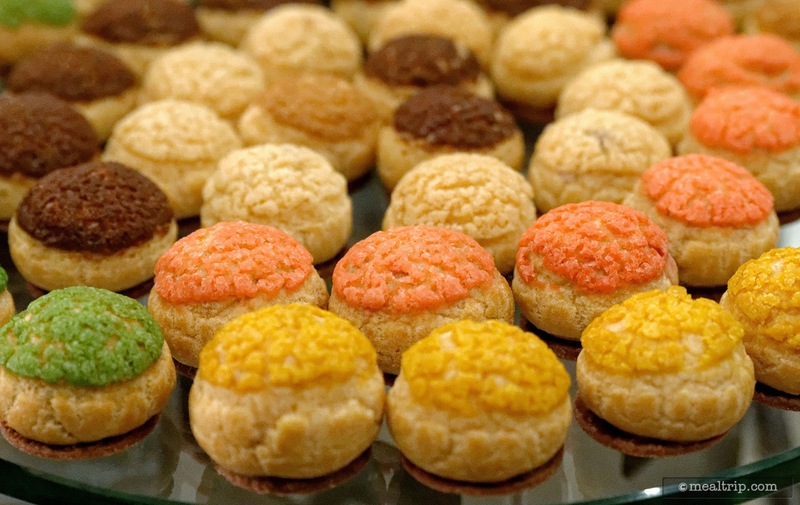 The Assorted Cream Puffs were very fresh! 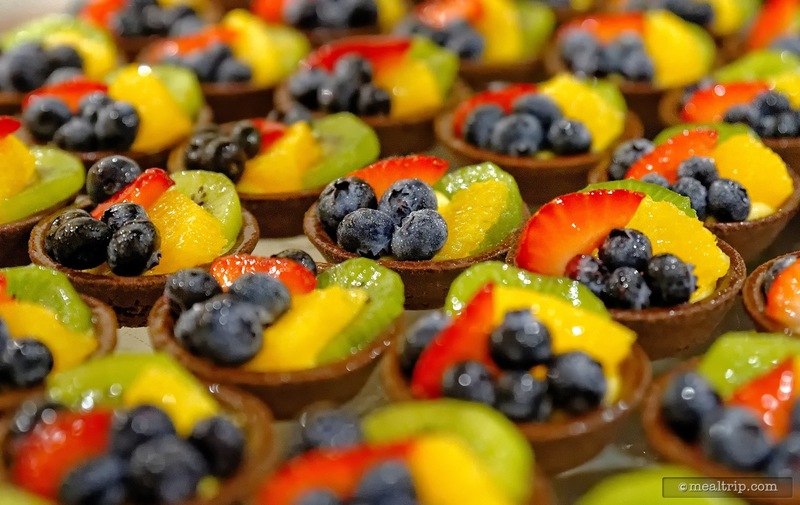 How gorgeous are all those little Fruit Tarts lined up like that? 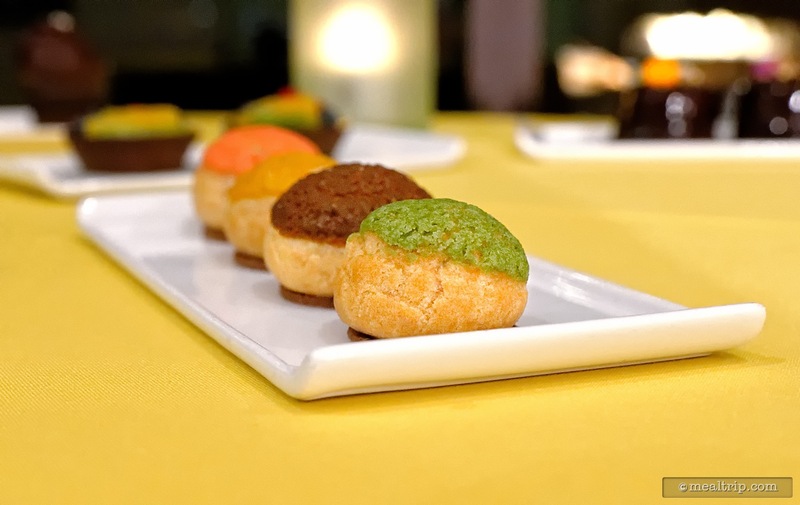 This was a really refreshing dessert... colorful and super fresh. The Hazelnut Crunch Cake was my favorite. 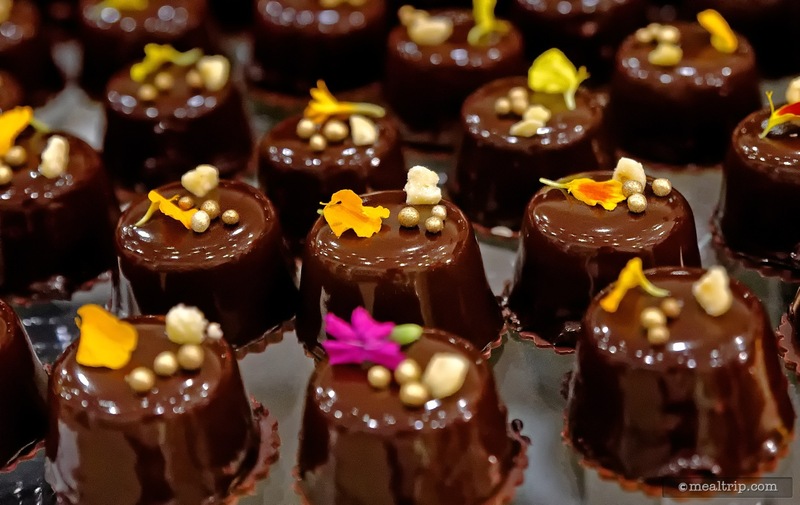 I love seeing (and eating) that gorgeous glossy chocolate poured over the cake. Here again, the edible flower and confectionery beads don't come out of a shaker. They were placed on there by hand (using tweezers). 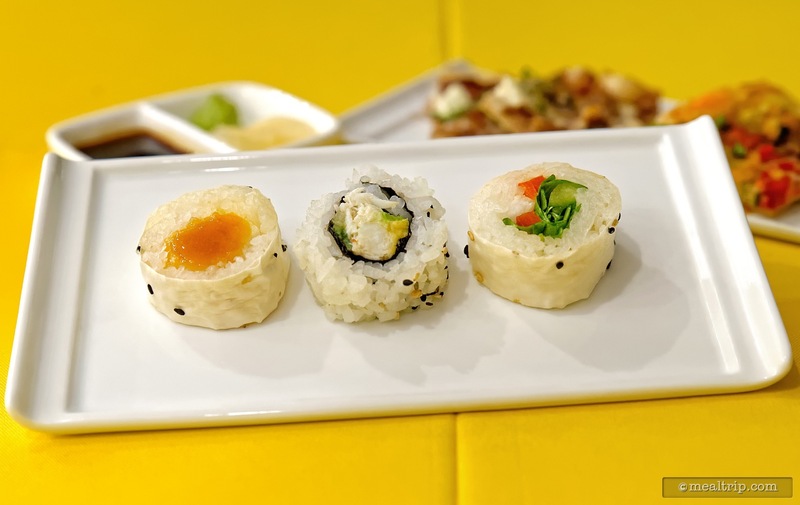 One of each please! 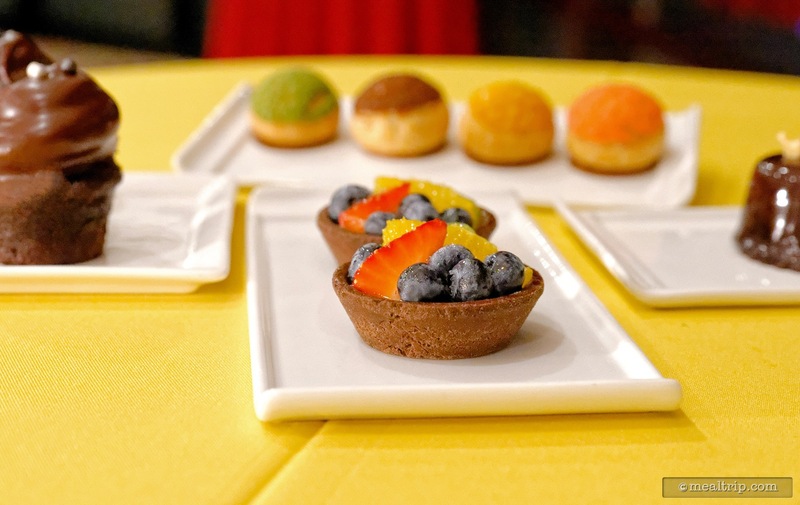 What great little plates for pastries! 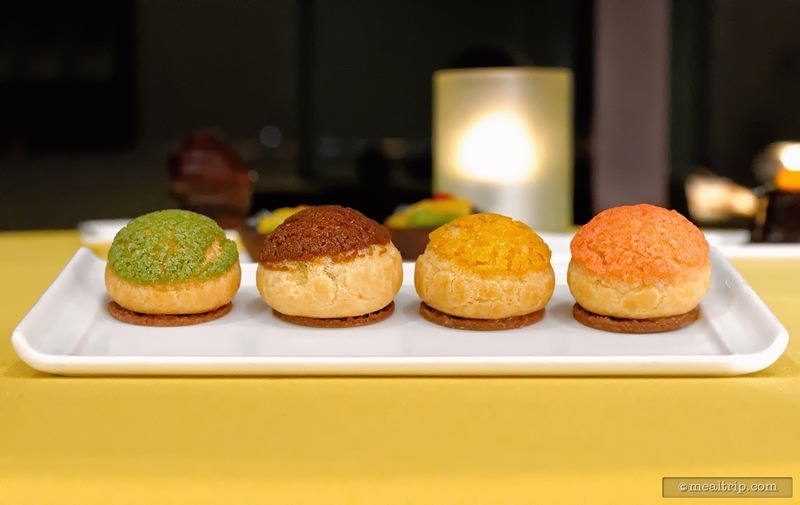 Another angle on the Assorted Cream Puffs at Celebration at the Top. 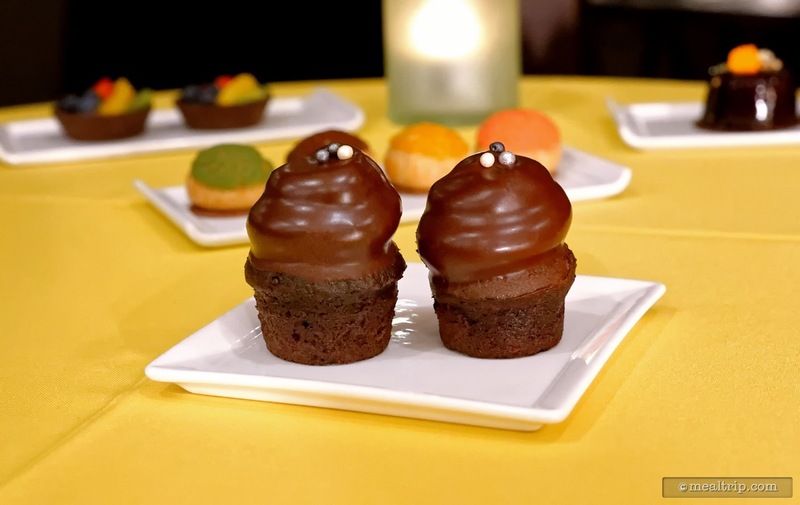 These Chocolate Ganache Cupcakes were so cool. 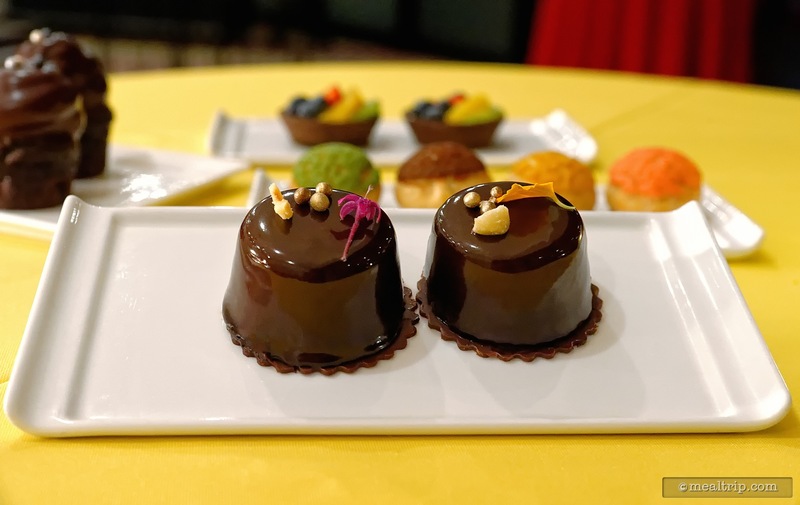 The ganache was on top, and then the whole thing was dipped in more chocolate to seal in the ganache! A close up of my favorite desserts, the Hazelnut Crunch Cake with glossy chocolate poured over the top!!! 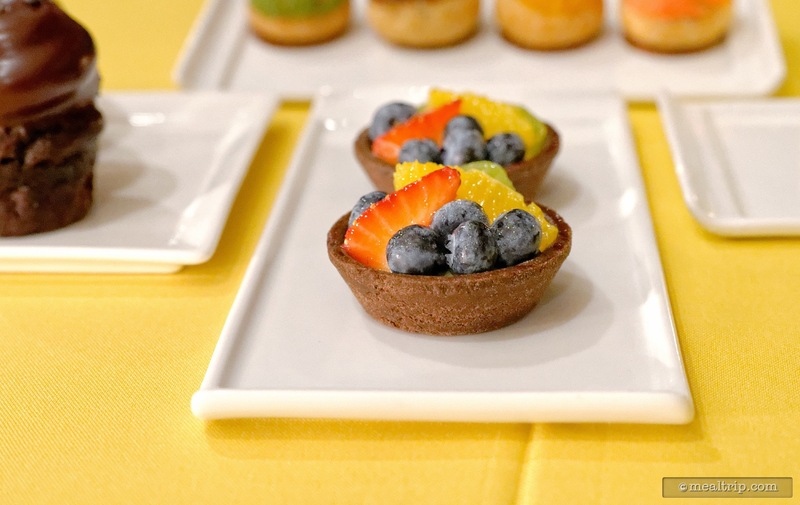 The fruit in the Fruit Tarts was sitting on top of a bit of vanilla cream in that fresh pastry cup. The fresh cut fruit was specifically placed, and all looked great. There was a strawberry, orange and kiwi slice along with several blueberries in each cup. It's so wrong to pop the whole thing in your mouth... but you're on vacation, and it's fruit... it's good for you!!! 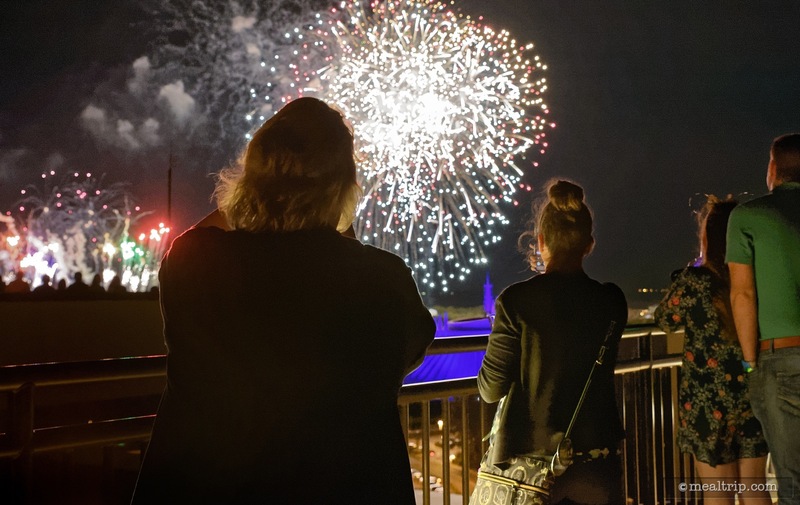 Watching the fireworks at Celebration at the Top - Savor, Sip and Sparkle. 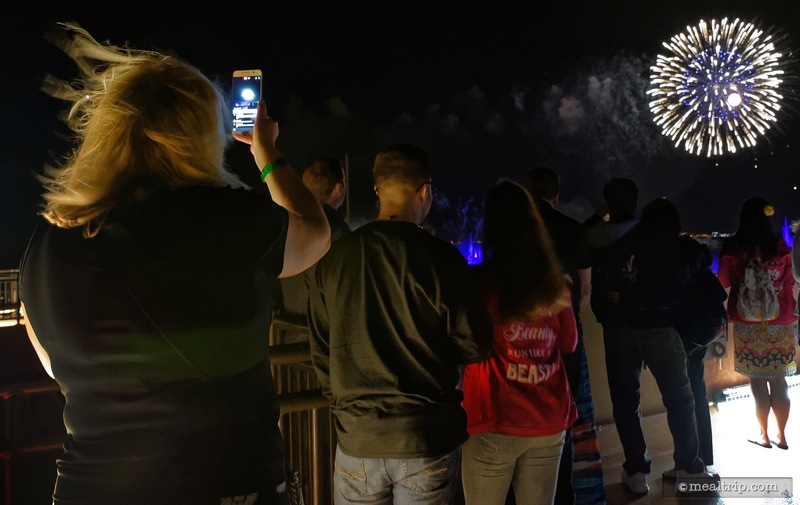 You can see a good bit of the Magic Kingdom below the fireworks. There are only 40 or so people on this platform, and the more you move north, the more of the park you can see. The guests standing on that other platform are "normal" California Grill guests. The platform that the Celebration at the Top guests are standing on is identical to that one. 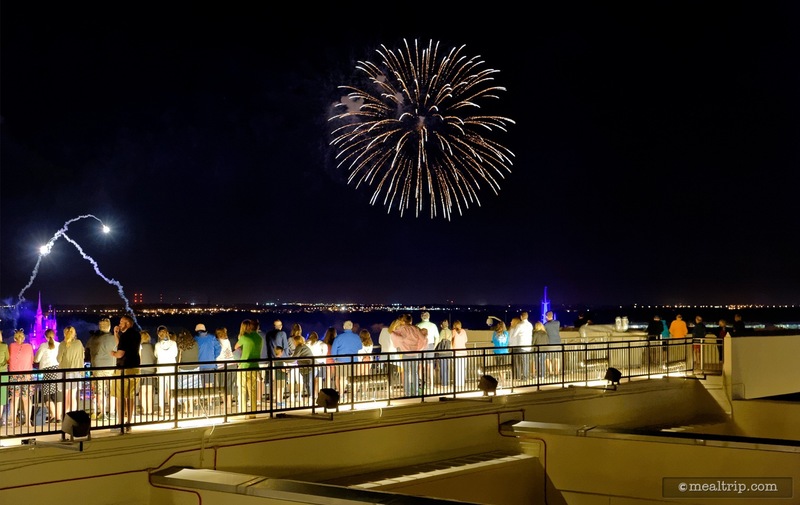 Both observation decks offer amazing views of the fireworks. 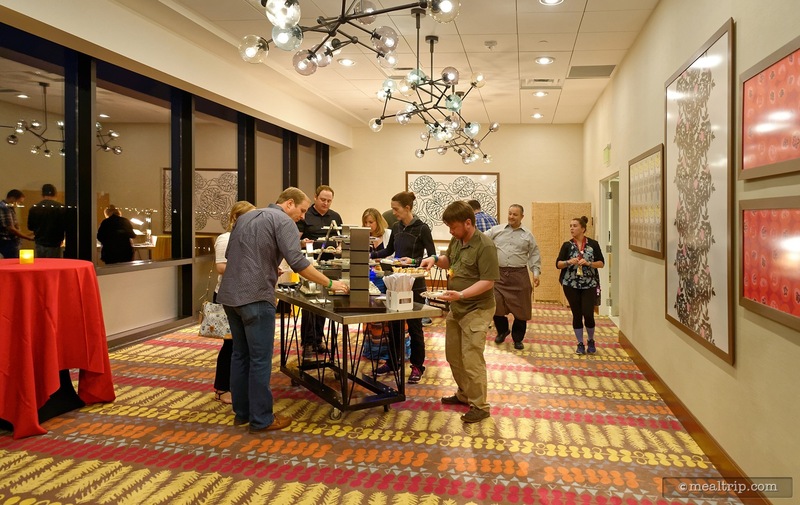 For this photo, I am standing very close to the door that leads back into the event space. If you walk out a bit further, you will see more of the park below the fireworks.